Carlene Jane Rigby entered into her Heavenly Father's Kingdom on Sunday, March 22, 2015. Born on August 5, 2010, Carly blessed her family with joy, happiness and adventure. As a member of The Church of Jesus Christ of Latter Day Saints, Carly loved learning the scriptures, singing primary songs and knowing that she is a daughter of God. Carly attended Stratford Academy, where she was eagerly learning to read. She had worked hard to overcome severe apraxia. Carly also enjoyed tap and ballet lessons at Madison's Dance Studio. Carly's big brown eyes and bright smile brought sunshine, even on the cloudiest days. Carly will forever be mourned by her family: parents, Jason and Jodi Rigby; brothers, James and Jacob, sister, Sarah Katherine (Snowy); great-grandparents, Carlene Holbrook, Athelene Carter, Webster Marlowe, grandparents, Bob and Suzanne Minarcine, James and Diana McKee, Stephen and Jackie Rigby, Curt Page and Domingo Price, Bob and Maria Greenway, numerous aunts, uncles and cousins and her very special babysitter, Amanda Martin. Carly was preceded in death by her brother, Glenn (3/22/00 – 11/2/05), her Papaw, Lester Carter, and her uncle, Charlie Bear. Funeral services will be held at The Church of Jesus Christ of Latter Day Saints, Macon Ward, 1642 Williamson Road on Friday, March 27 at 2 p.m. with Bishop Ryan Dixon presiding. Burial will follow at Riverside Cemetery (Madison Street). The family will greet friends on Thursday, March 26 from 5-7 p.m. at Snow's Memorial Chapel, Cherry Street. 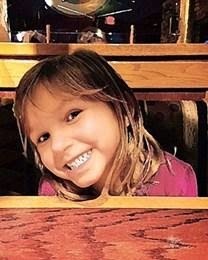 Our precious 4 year old granddaughter, Carly, died Sunday morning in her home. She was my shadow and helped me with yard work and watched airplane and car videos with me. We are all just devastated. Words escape us right now.